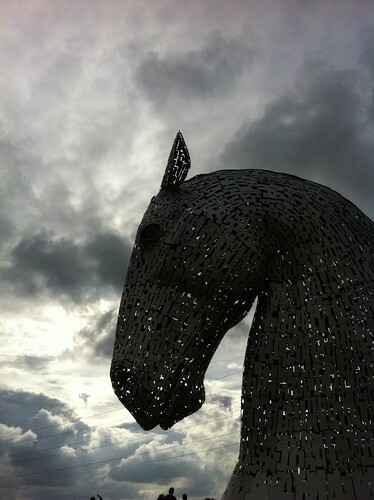 A fairly recent development just off the Stirling/Edinburgh motorway is the installation of these “kelpies”. I visited them at the weekend for the first time. They’ve been installed in a newly created park area which has lots of common space for roller-blading, cycling, walking, feeding ducks at the duck pond, a children’s adventure playground and so on, but everyone comes to walk around, and be amazed by, the kelpies themselves. I visited on a Sunday which is probably a more busy day but there were hundreds and hundreds of people there. I loved that so many people were walking, sharing time with family or friends, and gaining such sheer pleasure from this open air art. What a fabulous combination of art, community and healthy activity. Made me wonder if we don’t pay enough attention to the way art in particular can be a central focus of influence on our quality of life.